March is Colon Cancer awareness month and colon cancer is the third most common cancer afflicting all Americans regardless of age, gender or race. In fact, the incidence and prevalence of colon cancer are increasing in younger and younger populations. Join us for an informative talk on how to prevent, diagnose and treat this disease. Dr. Theodoropoulos is a board-certified colorectal surgeon who completed her surgical residency at Western Pennsylvania Hospital. 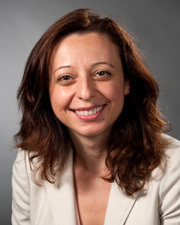 She is also Assistant Professor, Donald and Barbara Zucker School of Medicine at Hofstra/Northwell.